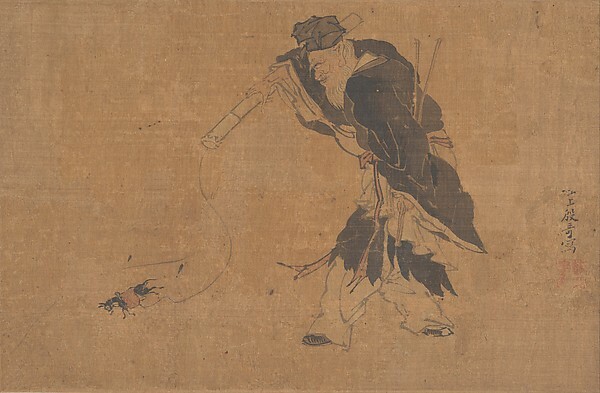 14th century depiction of Zhang Guolao and his magic mule, ink and colour on silk, from The Metropolitan Museum of Art. Zhang Guolao was one of the Eight Immortals – a group of legendary xian in Chinese mythology (xian means an enlightened person, someone who is spiritually and / or physically immortal). They are believed to know the secrets of nature and each represents male, female, the old, the young, the rich, the noble, the poor, and the humble Chinese. Old Age, Zhang Guolao, is one of the Immortals who actually existed as an historical figure somewhere in the seventh or eighth century. He is often depicted on board his white mule, with whom he could cover as much as 300 miles (a thousand li) in one day. When he was done, he could just fold his mule up and put it in his pocket or inside a gourd – to regain the mule’s true form, all he had to do was sprinkle water on it. Another story suggests that it was wine which caused the mule to change form; an unnamed emperor once rewarded the mule with wine after it performed a wonderful back-up, and it promptly turned into paper. One legend says how Zhang Gulao and his mule came across a cauldron of stew cooking in an abandoned monastery. They both devoured it only to discover that it was in fact a rare immortality potion being brewed by a local adept – so both Zhang Gulao, and his mule, are divine. Another origin story claims that the mule was already immortal, and that Zhang Gulao claimed his own immortality by finding this mule and then using it to chase a Unicorn through the cosmos. I like this idea a lot, but I feel that the cauldron legend does at least try to sound realistic. Mule or not? Sources on Zhang Gulao sometimes refer to him riding a white donkey rather than a white mule. Much of the contemporary art does show his “mule” with a donkey-like tail, so it is possible that mule is a more modern translation, or that someone who did not know the difference between the two animals used it interchangeably. Details of the Zhang Gulao legend – such as how many li he was able to travel, how he revived his steed, and so on – change depending on which version you’re reading, so this may be the case for the donkey vs. mule problem as well. A modern day (?) image of Palden Lhamo, artist unknown. Palden Lhamo, from Tibeten Buddhism, is a Dharmapala – a type of wrathful god(dess) which are believed to protect Buddhists from danger, ignorance and obstacles. If I understand correctly, Panden Lhamo is a wrathful version of various other goddesses, but is usually seen as the emanation of Remati. A particularly gruesome story tells how Remati sought vengeance on King Shinje of Lanka, her husband. Unable to convert him to Buddhism, and with their own son raised to kill Buddhists, she killed the son while the father was out hunting. She ate his flesh, drank his blood from his own skull, and used his flayed skin to fashion a saddle which she placed on one of the king’s finest mules and made her escape. The king, returning just as his wife fled, shot the mule in the rump with a poisoned arrow. Remati healed the wound and turned it into eye. Another version of this story tells how the mule was a gift from the gods – its covering was the skin of a demon, and its reins were venomous snakes. 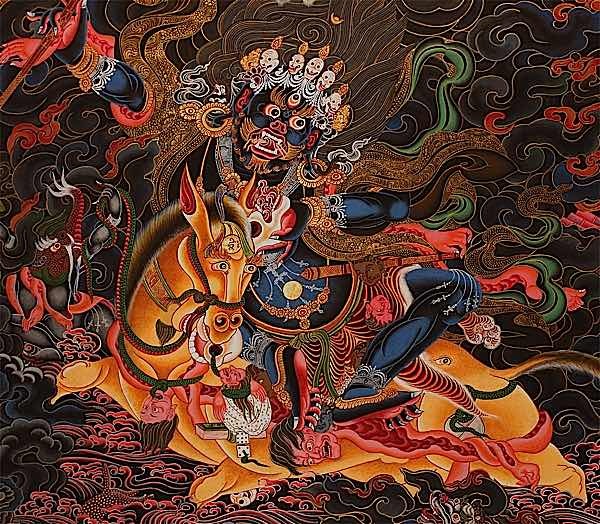 There is little description of Palden Lhamo’s mule, other than it is white (or sometimes brown) and has an extra eye on its hindquarters, but she is always depicted riding it – usually sidesaddle, and crossing a sea of blood. Mule or not? I would say definitely yes. I have not found any sources that describe her mount as a donkey or horse, and all the historical artwork appears to show a mule. Another 14th century illustration (!) 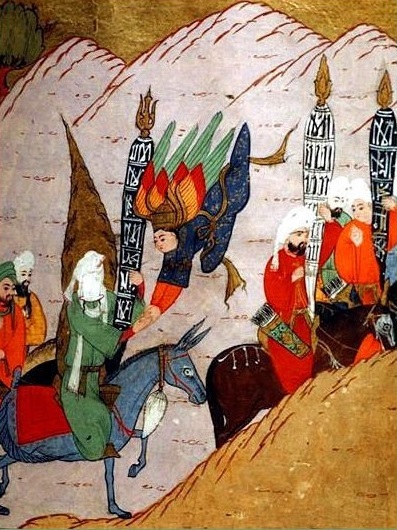 from the Siyer-i Nebi, showing the Prophet Muhammad riding Duldul, and being greeted by the Archangel Gabriel. I have already written at length about Duldul, the favoured mule of Muhammad, founder of Islam. You can read parts one and two here for a more in-depth exploration, but to give you a basic recap for the purpose of this list: Duldul, the “first mule seen in Islam”, was white or in colour and was Muhammad’s favourite. He rode her into many battles and she was of great help to him – she could sit or lie down on command, and one local legend even describes how she carried the prophet up a sheer cliff to escape danger. She outlived Muhammad and was looked after by his son-in-law, who would hand feed her as by then she was so old and toothless. Mule or not? A few sources refer to Duldul as a horse – a Persian literary character is even said to ride an Arabian stallion who was the descendent of Duldul, which is not impossible if she was a mule, but is unlikely. I couldn’t find any pictures of Sgoidamur’s mule, so here’s a photo of Buttons – see our Mule Tales section! Photo © Lisa Ernst. A 13th century compilation by Austrian poet, Heinrich von dem Türlin, tells how the dying king of Serre left his kingdom to his two daughters – bequeathing them a magical bridle that would preserve the kingdom for its possessor. The elder daughter, Amurfina, took both kingdom and bridle; and younger sister Sgoidamur, riding upon a bridleless mule, made her way to the court of King Arthur to ask for help. The first knight Sgoidamur meets is Kay. He takes the mule and embarks on a great journey across dark forests full of great and savage cats who all bow before the mule, a deep valley full of reptiles, and wide, sunny plains. He then encounters a deep black river, wide and fast-flowing, with bridge no wider than a hands-breadth the only way to cross it. The mule immediately jumps upon this narrow bridge and Kay returns in terror to Arthur’s court. Gawain then sets out with the mule, and is courageous enough to cross the bridge. On the other side of the river he finds a curious castle – there are heads mounted on sticks outside, and the high walls revolve like a mill-stone, meaning that Gawain and the mule only have a limited period of time to pass through the entrance on each revolution. They make it through, but the mule loses its tail. Inside the castle is deserted, but presently Gawain meets Gansguoter – magician, builder of the castle, Uncle of the two princesses, and slayer of many knights. Gawain must pass several tests before he is allowed to take the bridle: first he must behead Gansguoter (who returns again the next day), then Gawain must defeat two lions, then he must defeat the knight whose previous kills are displayed on the stakes outside the castle, and finally he must fight and kill two dragons. Triumphant, Gawain returns to Camelot with the mule and the bridle, and all the beasts of the forest bow to both knight and mule as they pass. It is postulated in the book Celtic Myth and Arthurian Romance that the mule itself may in fact have been another form of Gansguoter, based on a 12th century source in which Arthur tracks a mysterious white beast through the forest only for it to reveal itself as King Belnain; a trope in which the old god is seen as a tester of the young god. As the author rather beautifully puts it, “the old god should bring the young god to the scene of his trial, and that is just what this marvellous mule does”. There is also the French poem La Mule sanz Frain, by Paien de Maisieres, that is very similar and dates from the same time period. Mule or not? Definitely mule – or magician in mule form, at any rate!